The garage is generally one of the biggest rooms in most average-sized homes. You may notice that the majority of residents use the outdoor driving space to park their car. Inside the garage usually has an assortment of odds and ends. This can be stuff people cannot let go of. Or, sporting equipment, gardening tools, and other paraphernalia. Most garages are cluttered and have no real organisation. Here are some ideas on how to take advantage of this large space. Gather all your family members around the kitchen table. Have each member pitch their idea on how this space can be used. 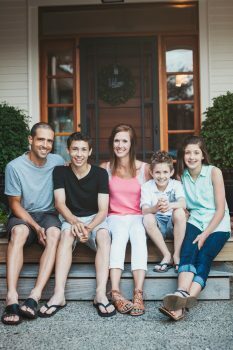 Make a record of the pros and cons and the estimated cost to transform your garage. Be practical and try and make this space an environment you can all share. Or, you may decide this is a space just for the kids. Alternatively, you may want a workshop, small office or games area. If you have children and have an average size home then space becomes a premium. Children like to create and have a certain amount of independence. It is not always possible to play outside because of the weather or the time of day. 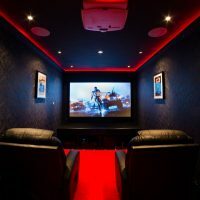 Why not revamp your garage into a games room. A ping pong table is a cheap game that can be used by 2 to 4 people. Add a dart board, a pinball machine, and even a soccer table. Then throw in a couple of old couches, a small fridge, and a rug. Your games room is almost complete. In addition, you can add a television that can be used for video games. Cost? Go onto Gumtree. You will be surprised how cheap some of these items are. There were 259 couches being given away for free in Melbourne alone. Also, you can find ping-pong tables for free. Do you bring your work home with you? Or, are you a self-employed tradesman? 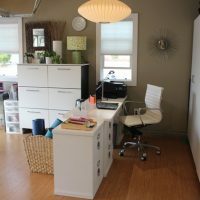 The garage is an ideal area to set up a small office. What you will need to run a typical small office. The bigger the house gets the more it costs. Included in a lot of house designs are separate entertainment rooms. These are set up as movie theatre rooms. 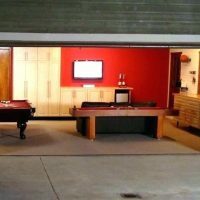 You can convert your own garage into a full-blown entertainment zone. Obviously, you will be needing seating which can include couches and single seaters. A projector or large TV with a good sound system. This can also be used for your own karaoke system. A small fridge and kettle. Some floor fittings, pictures, and some plants.